A sharp decline in the price chart of cryptocurrency is the hot news of the digital world, and investors are sweating all over again. Bitcoin which rose steeply in terms of price in the previous calendar year is now facing the exact vice versa. It’s not just the case of Bitcoin; in fact, most of the cryptocurrencies are being affected in a similar manner. What might be the reason for the decline in such a short period of time? Are digital currency world facing a doomed time? Is it the end of an era? What happens next? This article is going to give a solution for every such question, and something more. 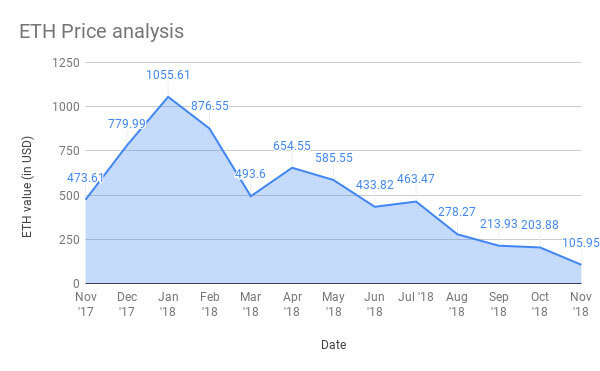 With regular research on the cryptocurrency industry, Epixel Solutions made an analysis of the reasons for the sharp decline. Read further to understand our expertize in this field.. 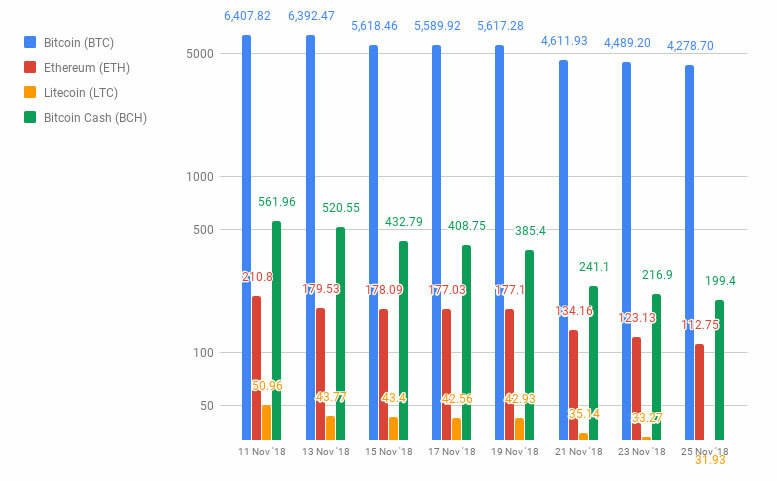 The price began to fall down from the third week of November and over a night everything got changed. The market price of Bitcoin fell down from $5,513.76 USD to $4,542.99, a drop of $1298.21 USD! 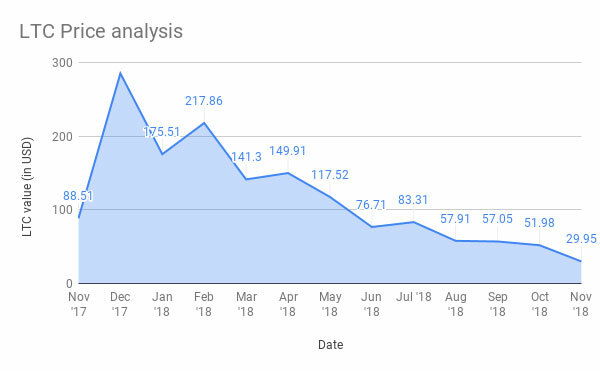 A big drop in the value is seen overtimes and the below Bitcoin price chart points out this drop. 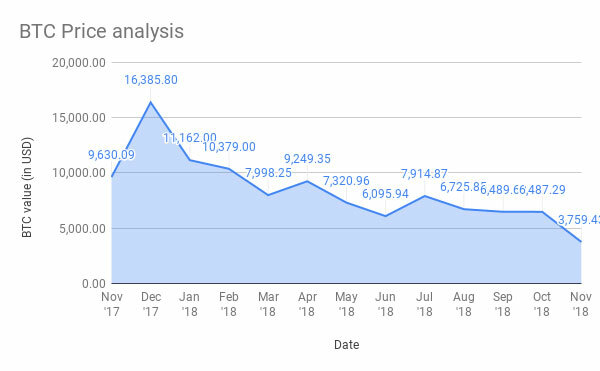 The above chart shows the sudden deviation, and here are some of the altcoin price charts to compare the price analysis with that of Bitcoin. Similarly, when you check the other cryptocurrencies price chart, then you can see this change out there too. Inference: This isn’t a natural drop and all we need to know is why this happened? Something suspicious is going around in the cryptocurrency world and there are many factors that may cause this fall. Well, there are many speculations and theories that spread like a wildfire and we’ll cover up that part here. Back in 2017, Bitcoin splits and hard fork resulted in Bitcoin Cash (BCH). A year after now, BCH once again underwent a hard fork and the “trust point” is the part to clear the air. A sharp drop has been witnessed recently after the fork and this might also be a reason for the decline in price. Theories and speculations – The story behind the crypto-fall! From various theories from expertise’s, we’ve managed to put forward some of the reasons that might trigger such an event. Here are some of the facts and figures that correlate with the plunge. Investment is a spectacular way to hold on with your financial life and settle yourself up peacefully. Everyone sees cryptocurrency as an investment platform and also as a payment option. After the Bitcoin price hike in the past year, internet users began to search on Bitcoins and other related currencies. Well, until that news, not everyone was at all aware of even their existence! The news created a new era, and a lot then invested in such digital coins. With great anticipation of bringing in a new life, they invested in Bitcoin via an exchange and that too with the real money. Still, the reason behind the sudden rise in the Bitcoin (BTC) is a mystery. However, recently officials from U.S government made an investigation, and reports seem to fit perfectly with the previous year’s hype. We’ll discuss it on the latter part of this article. There are many risks one needs to bear when you invest in Bitcoins or similar digital coins. The value is constantly subjected to variations and there are no regulations to control this flow. When people began to research more about these factors, naturally the conversion of probable to an investor went sideways. This is a possibility and yes, as per the data about 55.1% of the population is having an internet connection. So, they know how to surf or people who have come across this Bitcoin rise must have to dig up to learn about it. Well, cryptocurrency scams might be a possible reason for this decline, for example, Bitcoin scams created a negative impact on Bitcoin in recent times. It might have triggered the rates to fall and these scams do happen often in this industry. Investors lost a great amount of money due to this reason. With the emergence of Ethereum, the term – “token sale” began to catch up in the investor’s eye, and emerged as a new source to raise the fund. From the traditional crowdfunding to ICO, the funds are now easily acquired in several ways. Ethereum back in 2014 raised money using a token sale event, and it was first of its kind. FYI, token sales and Initial Coin Offering (ICO) are the same. And the funniest part is that there are no rules or regulations to follow during this event. And still, the required fund can be raised with such an event. If you can raise fund even without any regulations then, why going for some legal fundraising opportunities, and expose yourself up in lawsuits? People get cheated easily on such investments, and about 90% of ICO events are fake. So, if everyone realizes the opportunity then, they might be aware of all such facts and avoid such risk. This might be a probable chance to make the price fall. Developer mistakes and non-agreements results on a fork! When a new update on protocols in a digital currency is not acceptable then, the cryptocurrencies splits. This split produces a two-sided event where one group follows and accepts the new changes and stay on the same platform itself. With this new update, nodes who are running with the old version needs to update and proceed further for validation etc. i.e., all nodes have to update with new protocols. This results in a fork, and probably the currency and the system splits into two! Bitcoin cash hard fork can be considered as such an instance, and the price slash is more than 50% and is still falling down to the bottom. In November 11th, 2018, 1 BCH valued 561.96 USD, and on November 25th, the rate reached 199.40 USD. As an investor, if such events happen year after year, how can the investor make an investment? On what terms of assurance can he make the investment? This isn’t a mere probability of the current slash in the price; it’s more a fact that keeps the price of every digital currency’s fall. A business which depends on these cryptocurrencies is now even setting back or making a step back and facing a “freeze moment”. Let’s see the simple analytical model which we’ve prepared using the data of the past few days. 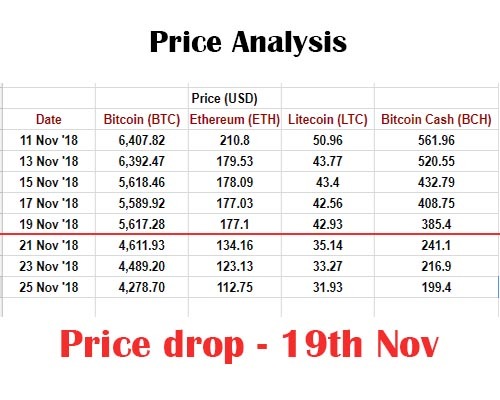 The above figures and graph show this change and from the day of 19th, the prices get slaughtered and are falling more deeply. Investing in currencies with probabilities that it might rise up in future etc. These all lead to one thing – loss of money! Lots and lots of people were affected with this agony of inexperience. 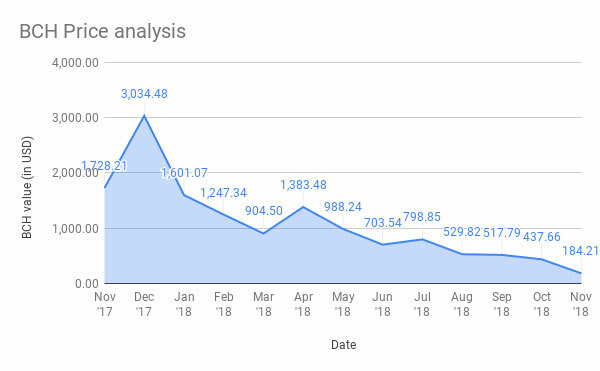 This might pull back investors and there are certain investigations going around about the Bitcoin surge of the previous year. As per the reports, Justice Department in the USA finds it odd about the sudden Bitcoin price and some price manipulation has been done using Tether coins. As per Tether, every single unit of Tether is backed by a dollar in the bank. They make such valuable claims but, there doesn’t exist any. However, the bank accounts are not exposed to investors. As per the Reports, Bitfinex and Tether are behind the surge. The source points out one thing, Bitcoin is backed by Tether and is considered as a stable coin. It is considered as the second most traded currency and BTC was an option to buy Tether. It might have improved and made the prices high. The questions that stand in front of you are –Last year’s price hike, a manipulation? A scripted act of hype? Currently, the Justice Dept. isn’t accusing anyone but everyone feels fishy about such scenarios. Government moves on digital currencies! Government official interrupts the growth of the digital currencies as they break the rules and laws. And with the emergence and popularity of these coins, the regulated fiat currencies are facing a high rate of competition. The demand for Bitcoin is one of the most reliable examples for the popularity. Well, on the contrary, the government officials are developing their own cryptocurrency but with regulations as well as a centralized team to take care on it. This might be the next possible reason for the diminishing rates. These are all probabilities and theories thus developed isn’t that promising. Let’s see what happens in the next few days or probably next few weeks. Are they going to rise back like Phoenix or is it going to be the end of an era? Let’s wait and see further!